As families across the US make their way to top summer tourist destinations, I got to thinking about a place that’s certainly on my bucket list of attractions to visit- Mount Rushmore. However, I’m terrified that my trip would be a letdown because I’ve already visited this engineering marvel through the eyes of Alfred Hitchcock in the film North by Northwest (DVD/Download) many, many times. Truly, without Cary Grant scaling Thomas Jefferson’s forehead, is there even a point to seeing it in person? North by Northwest is one of my favorite Hitchcock films, full of twisty plot developments, nail-biting suspense, and chic mid-century style. Cary Grant’s iconic grey suit is perfect for his portrayal of a Mad Men-era advertising exec, who through a case of mistaken identity, becomes involved in a secret spy mission to recover government documents from villains played by James Mason and a very young Martin Landau. Along the way Grant meets Eva Marie Saint, and they share a risqué rendezvous on the 20th Century Limited train. Can I just say, if train travel were as glamorous as it appears in North by Northwest, summer journeys would become a whole lot more appealing to me. Just imagine- craft cocktails, white linen tablecloths, en suite bathrooms, and Cary Grant waiting for you on a comfy bed in your cabin- what could be better? It was INCREDIBLY difficult to pick just one cocktail pairing for this movie because there are so many great beverage moments. First there’s bourbon, Martin Landau’s murder weapon of choice (see above photo). Then there’s the fabulous train that Cary Grant stows away on, the 20th Century, which incidentally has a cocktail named after it. But if I have to pick just one drink, I have to go with the beverage Grant orders in the dining car- The Gibson. It’s classic, it’s timeless, and sophisticated- just like this film. While watching North by Northwest, I recommend drinking a Gibson. Fill a shaker with ice, then add gin and vermouth. 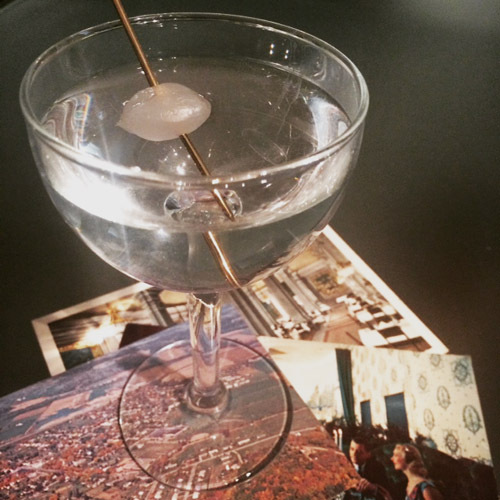 Stir well, then strain into a chilled martini glass. Garnish with an onion. There are several famous moments in North by Northwest, such as the big scene where Cary Grant is chased through a corn field by a crop dusting plane, and the climax on Mount Rushmore, but my favorite part is when he tosses his monogrammed matchbook to Eva Marie Saint as she sits in James Mason’s Frank Lloyd Wright-esque lair. Walking around with your own personalized matches- now that’s about as classy as it gets. Cheers! Posted in Classic Films and tagged Alfred Hitchcock, Cary Grant, Eva Marie Saint, Gibson cocktail recipe, James Mason, Martin Landau, North by Northwest. Bookmark the permalink. I am so excited this week to write about one of my favorite films from the golden age of Hollywood, The Philadelphia Story. One of the reasons this is a favorite of mine is not just because of its sparkling dialogue, beautiful art deco sets, and long langorous cocktail hours of a wealthy Philadelphia family, but rather because it stars one of my all-time favorite actors, Jimmy Stewart. In a strange coincidence, I was actually born and raised in Jimmy Stewart’s hometown of Indiana, Pennsylvania. However, I like to think I would have been a fan even if our ancestors hadn’t shared the same zip code once upon a time. The Philadelphia Story was actually the film that won Stewart his only acting Academy Award in 1941, and it’s easy to see why. His performance as writer Macaulay “Mike” Connor is just marvelous. The other two big stars of this film are Katharine Hepburn and Cary Grant. Hepburn plays a divorced Philadelphia socialite who’s engaged to be married once again. Her ex-husband (played by Grant) comes to see her the day before the wedding, bringing along two reporters who are there to cover the wedding, but really do little more than get under Hepburn’s skin. Hepburn and Grant’s verbal sparring is masterful, however it is truly Jimmy Stewart as a reporter who steals the show (and for a time, Hepburn’s heart). He breezes into all of his scenes, tall and lanky and charming, offering up the absolute best one liners. I swear, every time I watch him ask the librarian at a Quaker library “Dost thou have a washroom?” I get the giggles. This is also a great film for cocktail pairings because Grant has a long history with whiskey, and Hepburn and Stewart have a booze and moonlight-fueled tryst by the swimming pool. 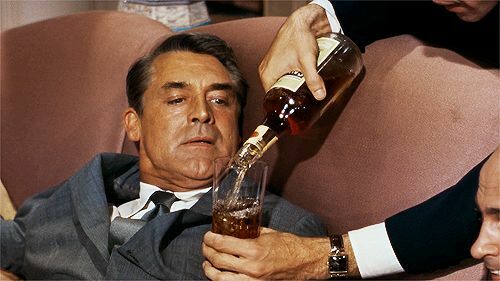 They break into the wedding champagne a touch early, giving Jimmy Stewart a chance to really show his acting chops as a happy drunk. When I watch this film, so many cocktail opportunities come to mind. On one hand, I’d love to mix up a batch of Uncle Willie’s Stingers, however with so much bubbly flowing, I’ve got to go with a classic champagne cocktail. This week, I’m serving up a drink called Cinderella’s Slipper (the name’s origin will become obvious about halfway through the movie). Place the sugar cube in the bottom of a champagne flute. Use the dashes of Angostura bitters to saturate the sugar cube. Add the brandy. As you fill the flute with champagne, the sugar cube will dissolve. Garnish with orange peel. This drink typically calls for a maraschino cherry as a garnish in the bottom of the flute, but I like to think that Hepburn’s character Tracy Lord would never do anything so gauche. Sip this as you watch Jimmy Stewart carry Katharine Hepburn around in his fluffy white robe, and I dare you to not chime in when he starts drunkenly shouting “Oh C.K. Dexter Haaaaven!” This film is classic Hollywood screwball comedy at its best, and I for one plan on watching it, champagne flute in hand, while imagining what it must have been like to be Katharine Hepburn back then. Cary Grant on my right arm, Jimmy Stewart on my left. Not exactly a terrible place to be. Cheers! Posted in Classic Films and tagged Angostura bitters, Cary Grant, champagne cocktail, Jimmy Stewart, Katharine Hepburn, Philadelphia Story. Bookmark the permalink.